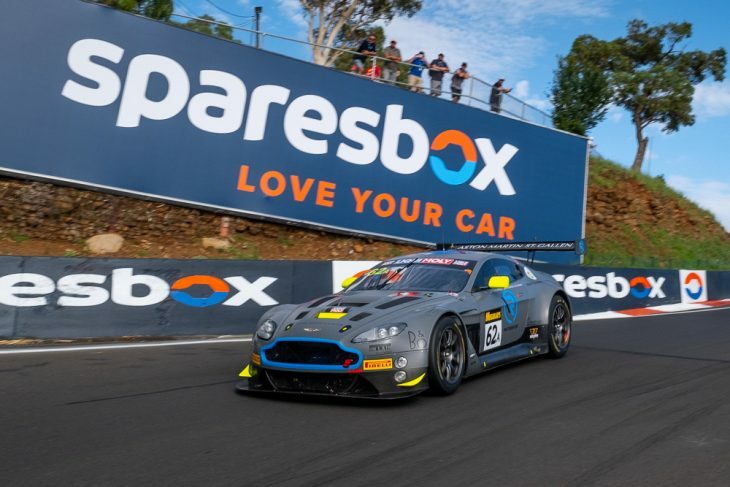 As the Bathurst 12 Hours heads into its final hour the race is well on track to smash the magic 300 lap total, a substantial distance record beckons! With only six Safety Car periods the second half of the race has been able to pan out rather organically. Similar to last year’s running, all of the teams at the front of the field are eyeing fuel numbers and trying to manage the remaining hour the best they can. Only time will tell whose strategy is the best but as things stand now it’s the #62 R-Motorsport Aston Martin Vantage with Jake Dennis in the lead. Second overall is the #999 Team GruppeM Racing Mercedes-AMG GT3 who elected to take just fuel and no tyres on their final stop. That decision helped them to leapfrog the #912 EBM Porsche 911 GT3-R who are now fourth. The #42 BMW Team Schnitzer M6 GT3 pitted in from the lead and at the end of the last pit stop cycle found themselves in third. There was huge drama for the #108 Bentley Team M-Sport Continental. After pitting in from the lead, and looking poised to leave the pits in third the car was struck with an electrical issue that prevented Andy Soucek from disengaging the pit speed limiter. Shutting the car off and turning it back on fixed the issue but cost the Bentley squad a possible podium. 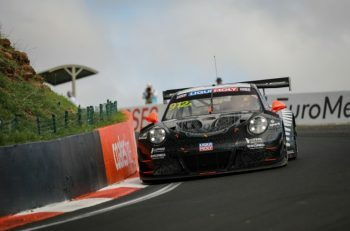 One contender who recently fell out of reach of the win was the #911 EBM Porsche 911 GT3-R. A power steering issue put that car into the pits early in hour nine and would spell retirement. It had been running close to its sister-car, the #912 EBM Porsche 911 GT3-R, which is very much in contention for the win. Mathias Lauda is in control of the Pro-Am class after dramas befell the #75 SunEnergy1 Mercedes-AMG GT3, a holed radiator accounting for the IGTC entry. The #51 Spirit of Race Ferrari 488 GT3’s weekend nearly ended before it got going after a severe practice crash. The team underwent a gargantuan effort to repair the car and get the weekend back on track. In Class B, the #4 Grove Racing Porsche 911 GT3 Cup is in the lead. 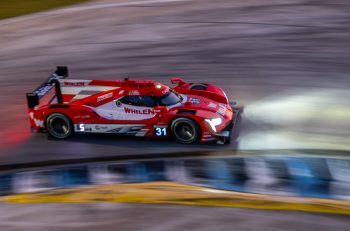 That team has led virtually the entire race, has a 22-lap advantage, and appears headed to their fourth straight win in the class. The #48 M Motorsport KTM X-Bow GT4 has the lead of the C-Class, despite brief drama when a piece of bodywork rubbed against the left rear tyre of the car. Since our last recap, the invitational class has been shaken up rather permanently, the #20 T2 Racing MARC II V8 the sole remaining runner. That’s a result of the #91 MARC Cars Australia MARC II V8 running into issues with their gearbox before eventually retiring. Twelve cars have officially retired from the event, while a handful of others are either running many laps down or are in the garage and being worked on. The #12 Competition Motorsports Porsche 911 GT3-R was the first to fall when David Calvert-Jones found the wall early in the day. The #22 Audi Sport Team Valvoline’s already damaged day came to an end when that car made hard contact with the wall at McPhillamy Park. The #777 Ben Motorsports Park Mercedes-AMG GT3 and the aforementioned #75 SunEnergy1 Mercedes-AMG GT3 both suffered from the same issue, a hole in the radiator. That damage ended the day for both teams. The #77 Craft Bamboo Black Falcon Mercedes-AMG GT3 came to a stop at the exit of the Elbow. Gary Paffet was on board when the engine overheated. DSC understands damage from contact earlier in the race led to that failure after the car ran wide with debris blocking the cooling inlets. The #43 Ashley Seward Motorsport Porsche 911 GT3 Cup suffered heavy crash damage at the top of the mountain, ending that car’s day. The race’s two MARC I entries have both retired from the event. The #92 Liajen Motorsport car was damaged earlier in the race and the #96 MARC Cars Australia had a differential issue. In addition to them, the #91 MARC Cars Australia MARC II V8 retired with gearbox woes. Engine related issues meant the end of the road for both #29 Trofeo Motorsport Lamborghini Huracan GT3 and the #34 Walkenhorst BMW M6 GT3. While a power steering issue took the #911 EBM Porsche 911 GT3-R out of contention.